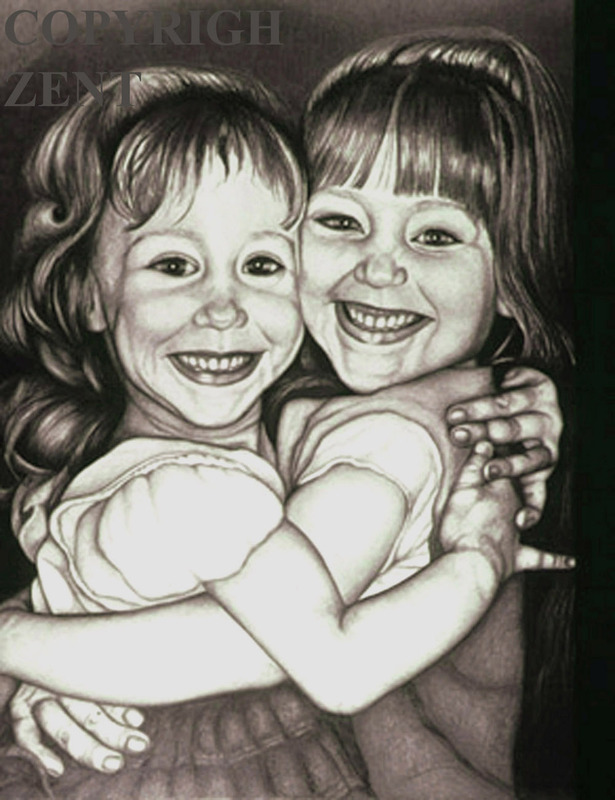 This drawing features my daughters Holly and Addie but while I was working on it I thought about my own sister and the special bond between us. We lost our mother when she was eight and I was seven and our father had left long before she died. Her life was incredibly hard because she had to work two jobs to make a living and she was not able to have us live with her. She paid the local children’s home in Green Acres, Florida to care for two girls who were then three and two years old.I can only imagine the emotional pain of being separated from your children although she came to visit and to take us out of that hell hole every chance that she got. She never knew the horrors that we were subjected to because we were afraid to tell her. We knew that we had to go back every time she took us out. But that’s the subject of another post. This one is about the incredibly close bond that was formed between us. Truthfully she looked after me as only a devoted sister could. She was always at my side trying to keep her impulsive sister out of trouble. ” Watch out he’s coming! or Don’t say that , you will get your head pushed down under water in that dark concrete sink.” Wherever I was she was not far behind. On my first day of school she was already in the second grade which were both housed in the same room. I wanted to sit with her but the teacher had other plans.I began to cry and was warned to stop. “Sob”. I was rewarded with a spanking on my first day of school! However, I also learned to write my name on the same day. That began my long romance with the pencil, the visual arts, and the power of words. We sang duets in church and we were good. Music and poetry was the legacy our mother left us. She sang the harmony and I the melody. We both only had to hear a song once before recalling every word and melody. Singing songs in my head and I am sure in hers was the way to face horrable events. When family came to tell us that our mother had died she sobbed uncontrollably. I was mute. My head could only hold one thought, “We are leaving this place.” For years I hated myself for this reaction but who would not be thrilled to leave this house of horrors. Besides I did not believe or know what death meant. Even when I saw her lowered into the ground I did not accept that she was gone. She was so beautiful and alive looking. Later I pretended that she had run away and was the movie star Frances Langford. She looked like our mother and had the same first name. We both spent many hours viewing her movies in the local theater. There were many more hard times to come but through it all my sister was my rock and still is. I owe her many apologies; like her comic book collection that I smuggled out of the house and gave away. If she had them now she would be a millionaire! I am sorry for all of the clothes I sneaked out and changed into that were hers and forbidden. She should have punched me for the many transgressions like the time I punched her because someone lied about my status and said that she told them. I should have trusted her and not some nameless girl who was out to make trouble. There is a deep apology owed for holding her in a scissors grip around her stomach almost cracking her ribs when we were wrestling. Oh, there were so many, many wrongs that I regret. But there were also special happy times like singing I’ve been Working on the Railroad and other hits? that we belted out while in the kitchen making the dish washing go faster. The lemonade stands were a favorite. We staged dress up theater productions for neighborhood kids and played elaborate classic games like Kick the Can and Hide and Go Seek. Not just the traditional versions, we covered several city blocks with ten kids scattered hiding. I should mention that my sister was perfection itself: always exactly dressed and groomed, punctual to a fault, a figure that made local boys swoon and me envy, and top-notch grades in school. I was a frequent embarrassment who wore jeans exclusively until the teen years, played football with the boys, skipped school, and was always late for important events. The family liked to describe me thus: ” June is funny” and they didn’t mean funny ha ha; they meant funny strange. I defended myself with my fist not nails, in other words a tomboy. How did she put up with me? Through all of this non conformity she stood beside me and only scolded in private. Woe be unto anyone who said an ugly word about her; they would be forever on my s… list. We were orphans except for our grandparents where we were finally given a real home. We bonded together from the beginning weathering every storm as one. For most of our adult years we have lived apart in distance but not in heart. That bond has grown stronger over the years. Each knows when the other has problems even over the miles. It’s usual for her to call and say, “Okay, what’s the matter?” and I have the same message reception with her. In some ways I believe a sister’s bond and love is the strongest of all and can only be broken by the death of both. So here’s to my wonderful sister; I will love you always! This entry was posted in Original artwork by June Pauline Zent, True Stories About Artwork, Uncategorized and tagged art, artwork, drawing, family, inspiration, love, photos, sisters, true stories. Bookmark the permalink. Sisters are definitely worth feeling blessed over, even when they can piss us off like no one else can. Good to see that you and your sister have such a strong bond that continues today! I hope my own sisters and I can be like that in the future. Beautiful photograph and beautiful drawing! Lillian, You always say the best things in your comments. I really look forward to them. 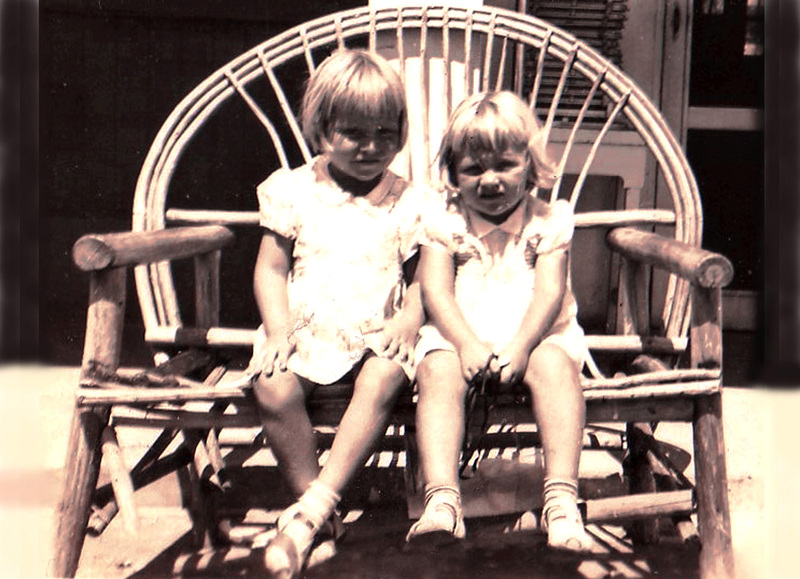 I know that my sister was often pissed with me but she was the first to defend me too. Time takes away a lot of the angst that usually happens in the teen years but as you grow older you realize how important that bond is. Thank you so much for your comments and compliments. Lovely drawing of your daughters, they’re adorable. Hi Maggie. I’am glad that you think its a tribute to her ; she certainly deserves it putting up with me, Yes, its a shame to be so far away but that bond is still strong and grows stronger as you grow older. Glad that you enjoy the drawing! First of all, I have always loved this drawing. I know it is of Holly and Addie, but I thought of it as us. I read A special sister bond at 6:30 last night. I was crying so hard I thought it best to leave a reply for this morning. I have always loved our Mother and always knew that she would have wanted us with her in a perfect world. I did not think you would remember everything that went on, but you remember much more than I thought you did. I have wondered through the years if I took care of you the way I wanted to. I know I tried, but had doubts. I was the mother, that was for certain. that concrete sink was the most awful thing i have to remember. I thought I was going to drown before she jerked me up by the hair. I was a tattle tail and told ms. akin what she was doing. I think she was fired after that.. Please don’t think for a minute that you owe me an apology. that was all part of growing up. There were so many great things that came out of us being together. We learned the tools that made us the two great people we are. The books and clothes are all sister things, that all sisters go through. You also learned trust when you did not believe me. That makes up for anything i felt at the time. If i was not such a wimp I could have beaten you in the scissor grip!! but i thought i would be hurting you and i would get in trouble. We did so many great things together.. Don’t forget grandpa’s switch if we were not in the house at 9:00 sharp. We even had fun with that. We are like twins and know when something is going on in both our lives. I love you with all my heart. my little sister. I could go on forever. You need to write a book about us and use the picture on top of this blog. Yes, I think that we did turn out pretty good in spite of all the hard times as kids. If you listen to the experts we didn’t have a chance but we learned to be fighters with compassion for others. I think that our grandparents helped so much by giving us a real home to count on. They were not perfect either but when I think back they took on a huge job raising two kids. You learn love from love and they gave us what we needed. The same for our Mother who’s love I never doubted. That carries you through the worst of times and allows you to be able to love others. In many ways we were lucky and one thing I know for sure I am lucky to have a sister like you! I love you always! Thanks for this. I didnt know about you and Marlene ever having been in a place like that. I only remember that you both lived at Granny’s and in my childs mind, never even questioned why. You two just “belonged” there. I agree with Marlene about you writing a book about your life experiences. It could help others who have had similair experiences. Love you too! Sisters are always special, but yours is more special than most since you had no-one but each other at such an early age. My sister always was and always will be the best friend I ever had. Oh, so good to hear you say this LB! I think that it is the strongest friendship bond that you can have. I feel sad for people who don’t have it. Thank you so much for coming here and for that comment. I love your blog and am delighted that you like mine! So glad that you enjoyed it Dilipnaidu. Yes , I have daughters too and they remind me of my sister. Thank you do much for the compliments! Beautiful post. Sorry it took me so long to read and comment…busy with my two girls!! No problem Mia. I would be the first to want you to spend time with your girls. Blogs are nothing compared to that job! Thanks for your compliment and taking the time to come here! Thank you for the amazing story and photos. I have six sisters. They are very close. Sister’s celebrate happiness and sadness together. Good to read poetry of love. Thank you. I will bet that most of the time you feel very lucky to have that many sisters. Thank you so much for the compliments and for taking the time to come here John. It is much appreciated! Beautiful post full of feelings . This is one of the smallest I can say , and not to spoil or even better not to jeopardize this wonderful feeling that overtakes my soul and the harmony of beautiful thoughts and positive thoughts about your art. thank you for this wonderful post! Thank you so much for the visit and bookmark. I will be looking for great post from you and will follow. Lovely post and beautiful picture! You are so talented. It’s a joy to see your work. Thanks for sharing. Thank you so much for taking the time to give me such wonderful compliments. I love your blog too by the way! This is beautiful! Do you sell prints? It sometimes seems that great art and beauty can be born from difficulties. I’m glad you are able to channel that depth into your artwork, which as always, is lovely. 🙂 Having someone special to be there during the tough parts makes then a bit easier, and makes the bright parts all the brighter. 🙂 Lovely post. Thank you so much for the lovely comments and for the visit. I will be checking out your blog as well! so warmly you wrote the feelings that you have for your sister. The way you have been together and then away,still being closer to heart shows the love amongst you both. Loved to know about your childhood June! Thank you so much Soumya for all of your great comments on my blog. One day I will write about my childhood which was full of trama but my sister was always there. It is an interesting story that might be usefull to others. I wili be reading your lovely poetry now that this computer is running again. You have greatly honored who your sister was to you. Beautiful. I am glad that you think so and she will be too. She is still keeping close watch over me after all these years! Thanks for the visit and the comment .It gives me an opertunity to visit you and your blog. Such a beautiful post!! Your pictures are wonderful as usual! Your comments always pick me up and you are always welcome here. Thank you so much! An enchantingly beautiful post, and the images frame it so very nicely June! My heart goes out to both of you! I do not think of you as strange, and yet some thought the same of me when i was younger…most people who are creative kinda get that tag….but you are special to me sister! Much love to you always! And you are so special to me Wendell! Your wonderful poetry and you attention to my blog as well as many others is a great contribution to our blogging community. Yes, I think most people don’t think me strange now although: How many other older people do you find living alone in the woods painting and writing? lol. My kids want me to move into the city but I think that more dangerous and a lot less satisfying, not to mention less creative. Just call me different. You are different too and that is what makes your poetry so unique. Much love to you my brother and friend. Hope that you have a great weekend too Rahul. Smiles coming back at you !